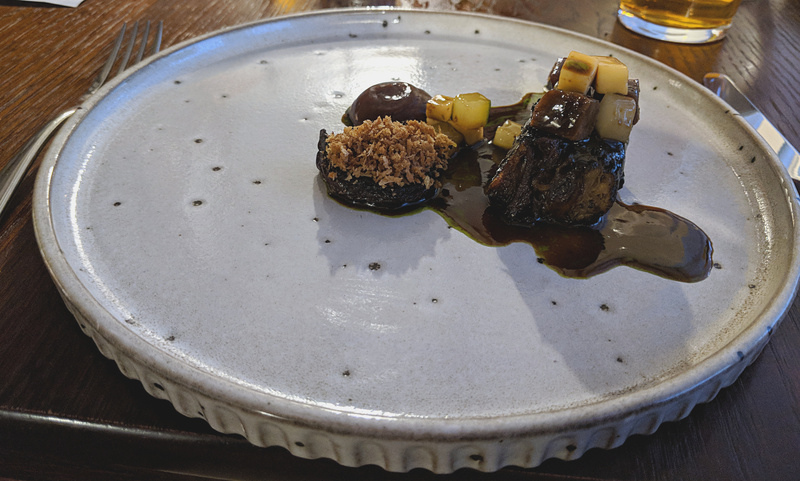 You may have not heard the name but in food circles in Nottinghamshire The Black Bull has been making waves for a while now. Their ambition has caught the eye of food critics as well as bagging them local restaurant awards. My only excuse for not visiting sooner is that it is certainly off the beaten path in the village of Blidworth. This is locally pronounced “Bliddeth”. Don’t ask. I had thought a full car park on arrival a good sign, Thursday night and they’re pulling the punters in. The patrons I had envisaged weren’t the connoisseurs of fine dining bought in by the recent accolades though. They appeared to mostly be builders having an after work pint. Nothing wrong with that of course but a different atmosphere from anywhere similar I have eaten. They have a casual pizza menu with a number options alongside their a la carte and tasting menu. The 6 course tasting was £40, if ordering 3 courses starters are £7/8, mains £15-20 and desserts £6-8. I will note that there were no vegetarian options for main courses which didn’t affect us but is surprising and a little disappointing nonetheless. We opted for the tasting menu. Having enjoyed well made bread with marmite butter the first course was “pighead, salmon, fermented blueberry”. The little stack of ingredients was neatly done but positioned oddly to one side of the plate. The pigs head was the best element, fatty but not too rich and cloying. Some little crispy puffs on top provided a nice texture too. Aside from that I didn’t think it came together that well as a dish. The blueberry was a bit of a sugary gloop that I wanted more acidity from. Salmon was a good version of what you might fry yourself but not a lot more. The next course was the perfect contrast, in many ways more simple but also more delicious. Tunworth, a British soft cheese, was oozing and strongly flavoured against sweet apple and earthy celeriac. A touch more refinement and that could easily grace the plate a very good restaurant. Hogget followed and whilst I could tell the sauce would be good from its luxurious shine it was all a bit brown and dingey. The meat was anything but dingey, perfectly cooked, melting in the mouth and complemented by that excellent sauce. There was enough freshness to be had from the accompanying veg, though there could have been a little more of it. The final savoury course was fish, a little surprising as I would expect to see this come before the hogget as the lighter dish. That said I thought it was the best looking plate of the evening. A little colour goes a long way. The cod was very well cooked, big pearly flakes of fish separated easily from each other and were delightful with the salty sea vegetables and creamy sauce. I believe the vibrant orange blob was mostly confit egg yolk, although my girlfriend was convinced that was at least some evidence of roe that gave it a fishiness. This fish’s partner in crime was an artichoke dauphinoise with a sliver of ham on top for another salty / creamy hit. There was an optional cheese course but the tasting menu already seemed decedent enough for a Thursday night so we passed. Onto 2 desserts. 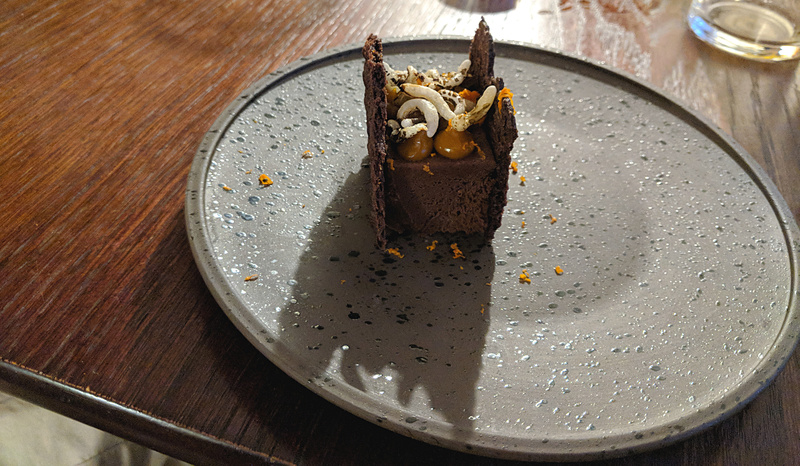 The first was a chocolate and sea buckthorn sandwich. Sea buckthorn is a bright orange berry that is so tart a friend of mine has it amongst his least favourite foods. Here it pretty muted, maybe too much so. The chocolate biscuits and thick gooey, chocolate in the middle had distinctly different flavour profiles which made for an accomplished dessert. The buckthorn did cut through the richness of it all but I couldn’t help thinking that the more traditional pairing of raspberry would actually have been better. The final course was another that wouldn’t have pleased my friend, this time rhubarb the chief offender. It was similar to an Eton mess, crushed meringue scattered over some stewed rhubarb with a sort of white chocolate pannacotta beneath. Enjoyable no doubt but it felt like a dish you could replicate fairly easily at home. Service from the waitress was enthusiastic and well meaning but she didn’t appear that knowledgeable about the food and drink offering. The dishes descriptions are quite short so I would have liked a little more detail about some of the elements when they arrived. Before desserts I asked if they had any dessert wine, she had to go check and after a period returned to say no. I would expect somewhere that offers a tasting menu with a couple of desserts to have at least one option here. There is some good cooking on display at The Black Bull and an appealing menu. 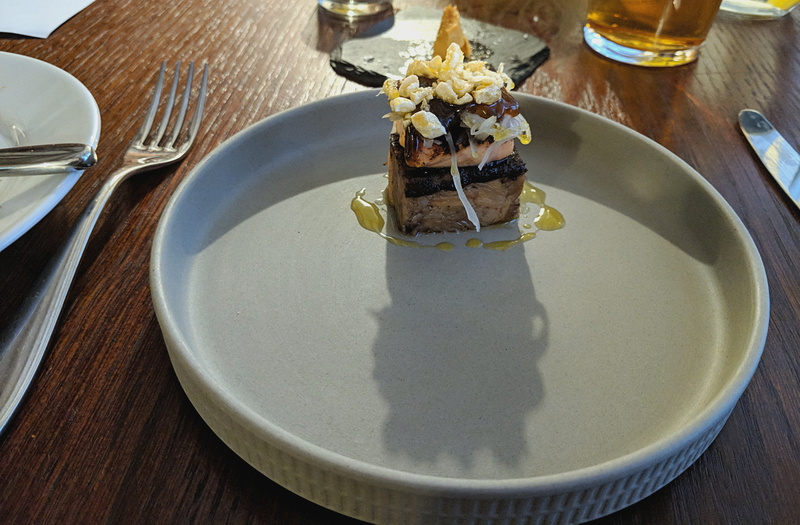 Their competition is stiff however, closer to the city can get you 5 courses for £40 at Alchemilla and that is a much more accomplished experience. If you are already North of Nottingham then I do believe this is one of the best establishments around, far better than my disappointing meal at Tom Brown’s for example. The chefs at The Black Bull are pretty young from what I have seen written about them and there appears to be plenty of talent in that kitchen. With a slightly different platform they could really excel.